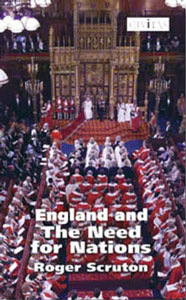 In this classic Civitas pamphlet from 2004, the philosopher Roger Scruton argues that the nation state is the bedrock of democratic progress and that we abandon the concept at our peril. But a process has been set in motion that is expropriating the sovereignty of our parliaments and courts, and dissolving the nationalities of Europe in a historically meaningless collectivity. As we stand at a potential turning point in our relationship with the EU, we have to choose whether to go forward to that new condition, or back to the tried and familiar sovereignty of the territorial nation state. Yet our political elites speak and behave as though there were no such choice to be made. Scruton is also a regular contributor to The Spectator and a contributing editor of The Atlantic. He is a senior fellow at the Ethics and Public Policy Center in Washington DC.